This college football season, 13 of 128 teams in the Football Bowl Subdivision (FBS) will be led by African-American coaches. In 2016, black players made up 53.8 percent of student-athletes at the Division I level in FBS football, while black coaches made up only 10.1 percent of their respective category. There are two first-year coaches (Charlie Strong and Willie Taggart), six coaches in their sophomore years, and five coaches who have four or more years with their respective programs. The coaches will face each other five times this fall. The first game is Sept. 15, when Illinois and Lovie Smith square off against Strong and the University of South Florida. 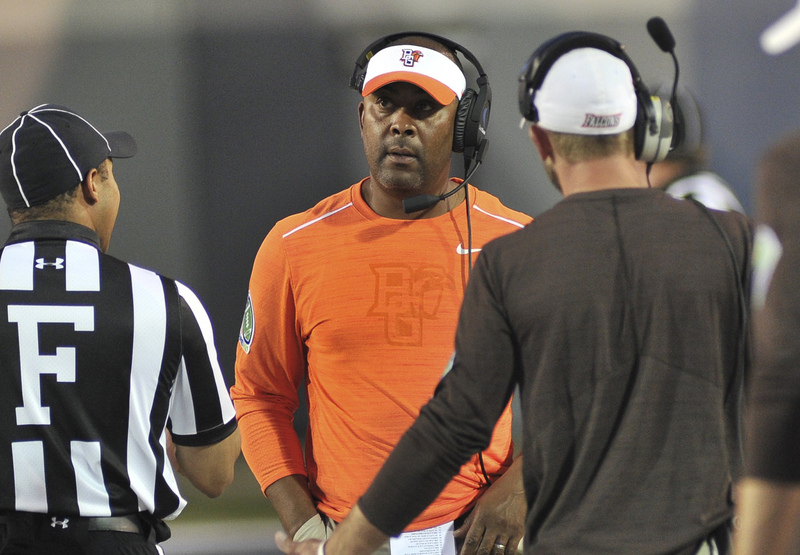 The last game is on Halloween, when Paul Haynes’ Kent State and Mike Jinks’ Bowling Green meet. 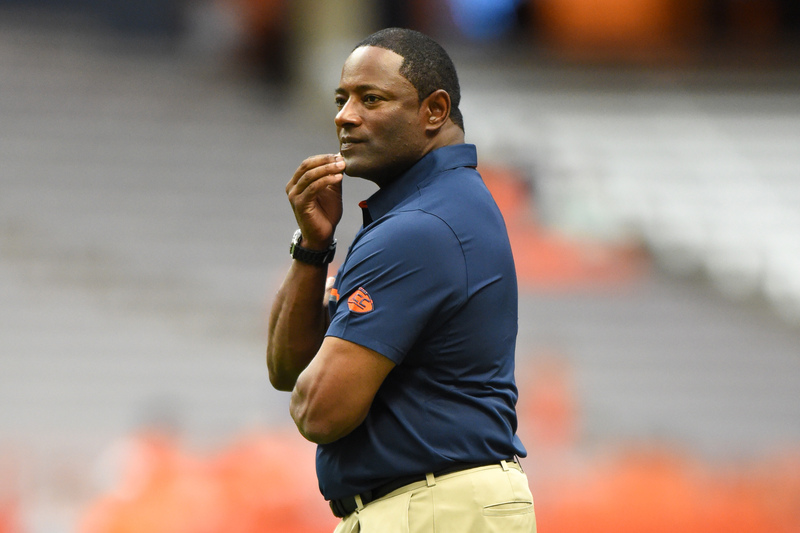 Syracuse Orange head coach Dino Babers looks on before a game against the Colgate Raiders at the Carrier Dome. Dino Babers, Syracuse: Had it not been for quarterback Eric Dungey being lost to a late-season injury, Babers more than likely would have directed the Orange to bowl eligibility. The team averaged 25.7 points per game and upset Virginia Tech in 2016, and with the junior quarterback returning to the lineup at full strength, the future is promising for Babers’ team. Maryland transfer Amba Etta-Tawo recorded 94 catches for Syracuse last season, and his production will be missed in the passing game. The Orange hope to see improved and consistent play from their offensive line; running back Dontae Strickland, who finds himself atop the depth chart, expound upon his 566 yards; and receivers Ervin Phillips and Steve Ishmael continue to do damage on the outside. Defensively, Syracuse can’t allow the nearly 40 points (38.6) it did last season. Penn State Nittany Lions head coach James Franklin jogs on the field during warm-ups prior to the game against the Army Black Knights at Beaver Stadium. 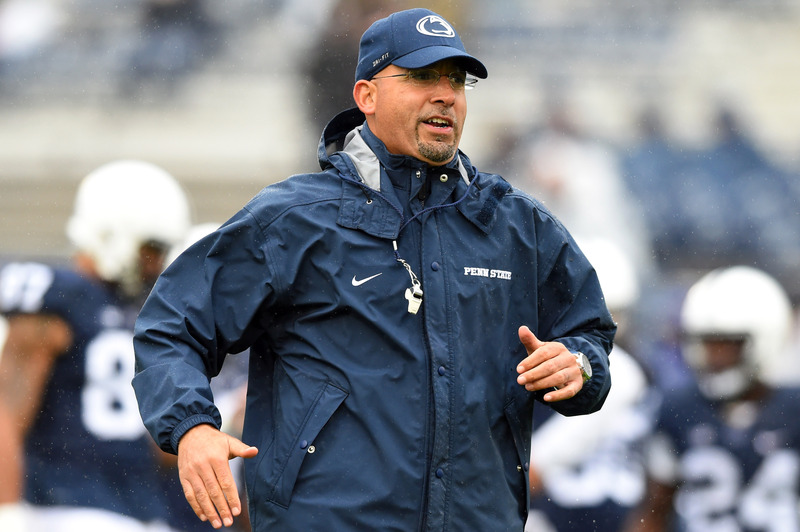 James Franklin, Penn State: The Nittany Lions just missed the cut for the College Football Playoff last season after using a second-half push to take the Big Ten championship and make a case for their inclusion in the national championship playoff conversation. This season, Franklin and Penn State will face their toughest games in road matches at Ohio State and Iowa but will welcome Michigan and Nebraska to Happy Valley. Quarterback Trace McSorley, as well as running back Saquon Barkley and tight end Mike Gesicki, all return as prominent playmakers from 2016. While McSorley lost Chris Godwin to the NFL draft, keep track of DaeSean Hamilton, DeAndre Thompkins and Saeed Blacknall, who each caught 34, 27 and 15 passes, respectively. Franklin has lost cornerback John Reid for the year to a knee injury in the spring, and with Garrett Sickels and Evan Schwan leaving the program via the draft, there are questions at the defensive end position. Kent State head coach Paul Haynes reacts to a penalty call during the game between the Buffalo Bulls and Kent State Golden Flashes at Dix Stadium in Kent, Ohio. Buffalo defeated Kent State 18-17. 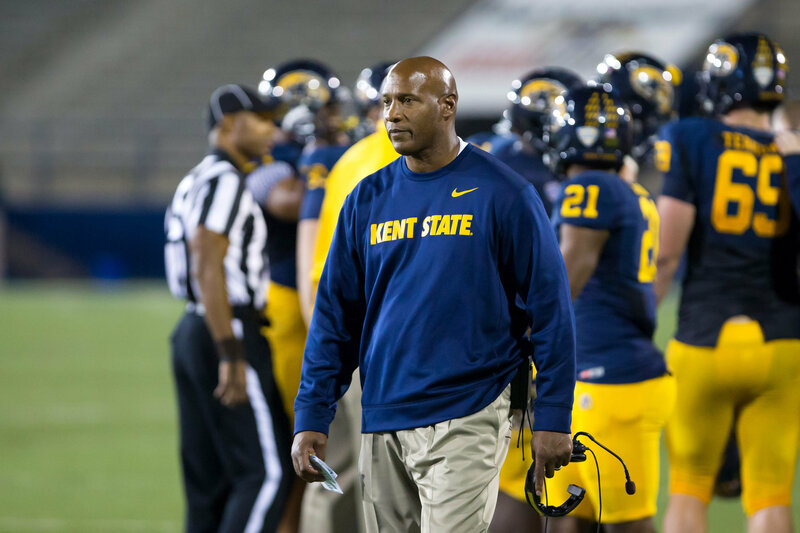 Paul Haynes, Kent State: Is it possible for the Kent State defense to carry the team? Haynes’ unit allowed just over four touchdowns a game (28.7 points) and one pass play of 50 yards or more and retained standout defensive tackle Jon Cunningham. But the Golden Flashes have not shown well in the past three years, collecting only eight wins over that span. Haynes’ chances of staying put at his alma mater rest firmly on the shoulders of quarterback Nick Holley, who converted to the position from wide receiver after a string of injuries decimated the signal-caller position. The senior did well, amassing 1,923 total yards. But 20.6 points per game isn’t going to cut it offensively, so it remains to be seen what the 5-foot-10 quarterback will be able to do with a full year. Bowling Green Falcons head coach Mike Jinks during the first half against the Memphis Tigers at Liberty Bowl Memorial Stadium. Mike Jinks, Bowling Green: There’s no way to dress up a 4-8 finish, and especially one that comes on the heels of winning the conference. However, Jinks won three of those four games in the final three weeks of the season and has a little something to build on for 2017. The wideouts, led by Teo Redding and Scott Miller, are the strength of the offensive unit. If the offensive line, which lost three starters from last season, can find some stability and provide protection for quarterback James Morgan and open holes for backs Josh Cleveland and Donovan Wilson, this could be a much-improved group. Unless the defense, which allowed almost 40 points a game (38.3) and lost six starters, figures it out, the Falcons may only see minimal gains from last season. 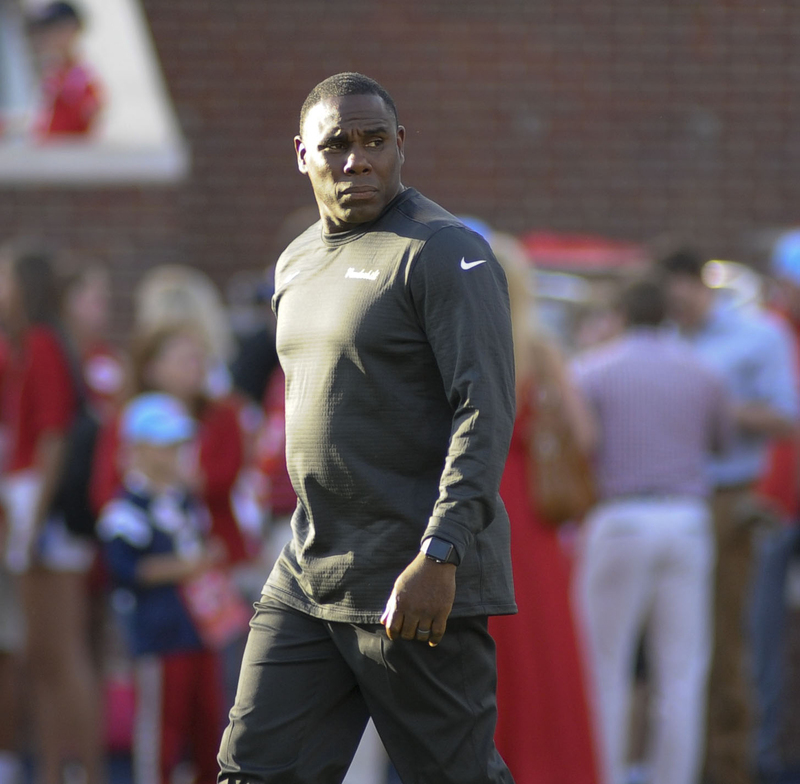 Vanderbilt Commodores head coach Derek Mason during the game against the Mississippi Rebels at Vaught-Hemingway Stadium. Derek Mason, Vanderbilt: In his third year, Mason was finally able to lead the Commodores to their first bowl under his stewardship. A 2-4 start only made for a more dramatic finish as Vanderbilt beat Georgia, Ole Miss and Tennessee in three of its four second-half wins to become bowl-eligible. The four wins in the final six games were largely powered by the offense, as quarterback Kyle Shurmur found his rhythm. Running back Ralph Webb is looking to three-peat as a 1,000-yard runner. For the past two years, Mason has been the play-caller for the defense, and last season the Commodores finished fifth in scoring defense and allowed only 5.4 yards per play to their SEC conference rivals. Mason can rest easy knowing he has all four starters in the secondary coming back. 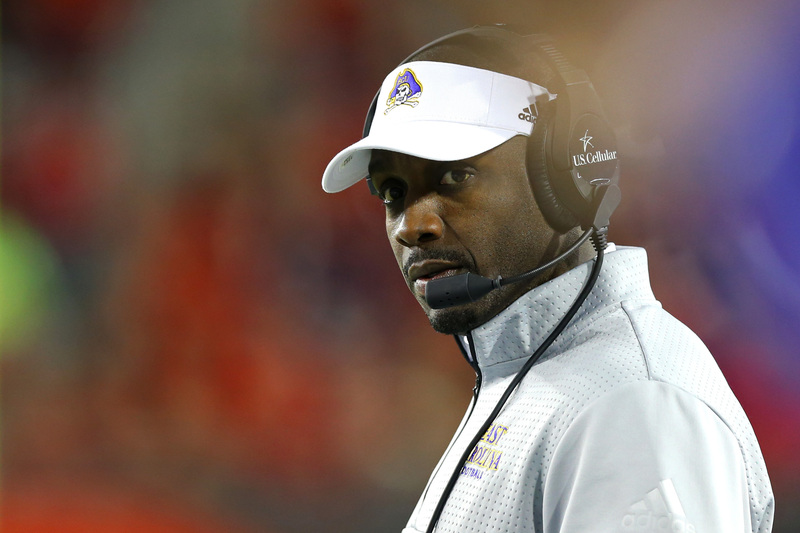 East Carolina Pirates head coach Scottie Montgomery looks on in the first half at Nippert Stadium. Scottie Montgomery, East Carolina: Montgomery was able to lead the Pirates to a win over in-state rival North Carolina State, but that was about the most exciting moment for the 3-9 East Carolina team last season. Montgomery decided to fish in the graduation transfer pond and came back with former Duke quarterback Thomas Sirk, who is returning from a torn Achilles tendon, former Clemson running back Tyshon Dye and defensive end Gaelin Elmore from Minnesota. If Dye can help improve the 132.4 yards and 3.9 yards per carry on the ground from last season, that would be a major boost. The defense was one of the major reasons for the team not garnering more wins, yielding 36.1 points per game and coming in dead last in the American Athletic Conference against the run. Montgomery has added Elmore and Auburn transfer Tim Irvin to the mix. 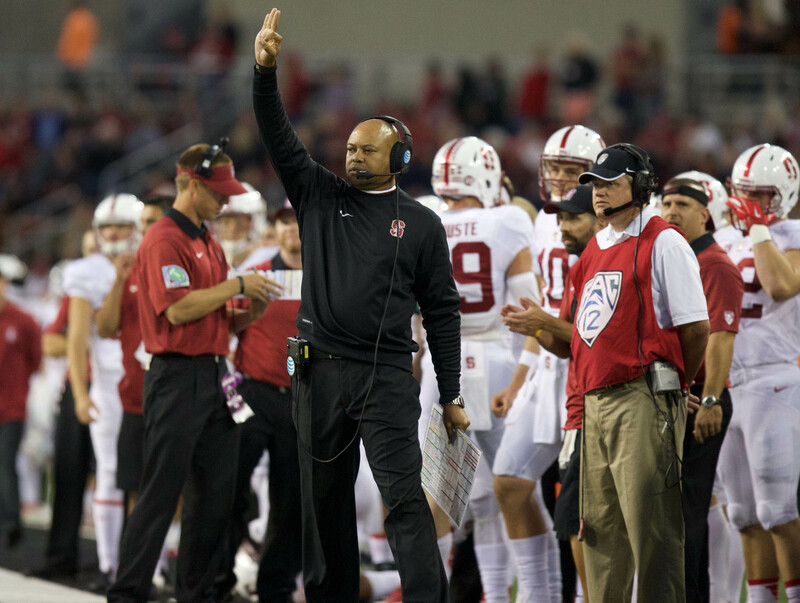 Stanford Cardinal head coach David Shaw against the Oregon State Beavers at Reser Stadium. David Shaw, Stanford: Shaw has the most decorated résumé of the coaches on this list, and he’s also been at his current post the longest. In five of the past six seasons, Shaw has directed the Cardinal to at least 10 wins. Stanford won the Sun Bowl in dramatic fashion last season over North Carolina and helped produce two top-10 picks in this year’s draft: defensive end Solomon Thomas and running back Christian McCaffrey. New feature back Bryce Love gained 180 yards and scored a touchdown in Stanford’s season-opening 62-7 win against Rice. Four starters return on the offensive line. Quarterback Keller Chryst injured his knee in last year’s bowl game but returned to help lead the Cardinal to 656 yards of total offense against Rice. Stanford and Washington will battle for the Pac-12 North crown. 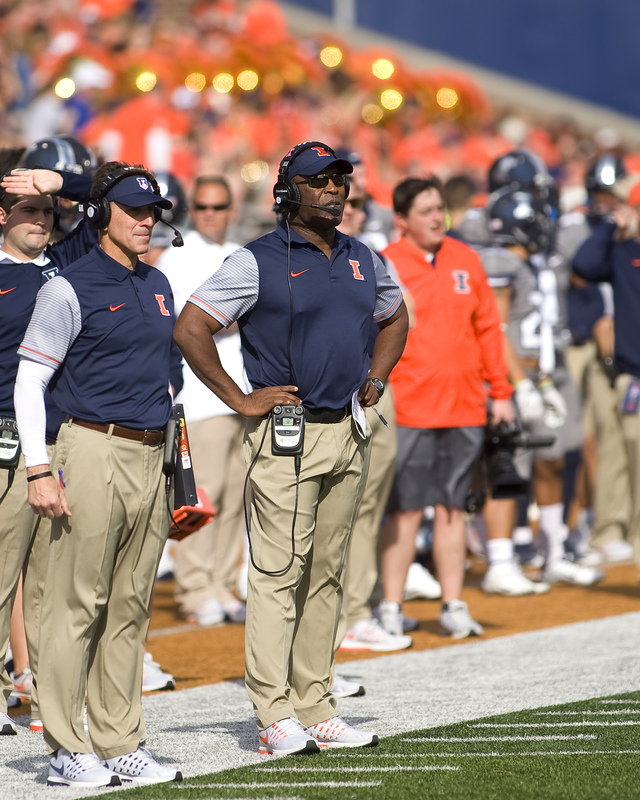 Illinois Fighting Illini head coach Lovie Smith observes the action against the Minnesota Golden Gophers during the first quarter at Memorial Stadium. Lovie Smith, Illinois: In his inaugural season, Smith coached the Fighting Illini to two wins in conference and three overall. Just eight starters return to the team. There are questions surrounding the quarterback position, and the strength of the offense lies with its offensive line, which gave up only 20 sacks and has retained three starters. Running backs Kendrick Foster and Reggie Corbin will have to do a lot of the heavy lifting. Malik Turner (48 catches) and Mike Dudek, who is coming back after a two-year hiatus due to a knee injury, are dependent on quarterback Chayce Crouch having some success to see dividends. Smith’s defense allowed 31.9 points a contest and finished 12th in the Big Ten against the run. 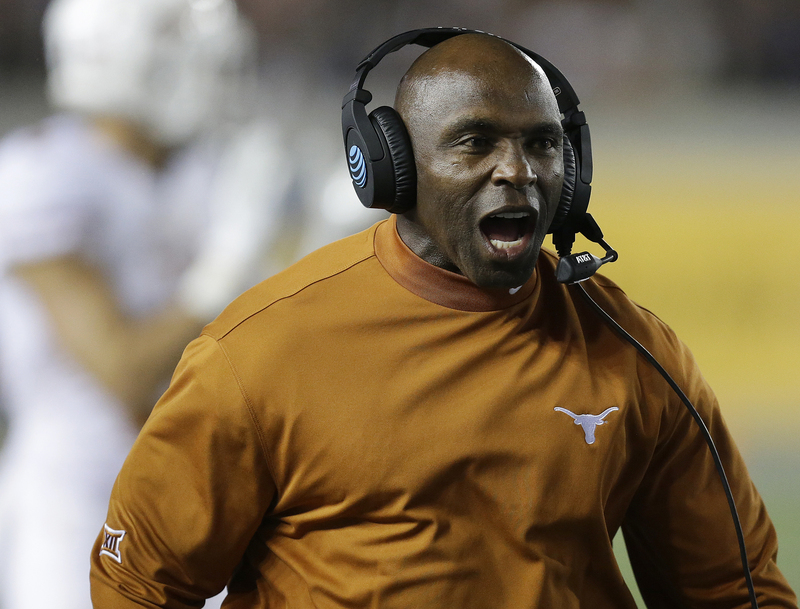 In this Sept. 17, 2016, file photo, Texas coach Charlie Strong yells during the first quarter of an NCAA college football game against California in Berkeley. Charlie Strong, USF: Strong inherited a talented group from former coach Taggart. Junior quarterback Quinton Flowers passed for two touchdowns in USF’s season-opening 42-22 win against San Jose State. He is coming off a season in which he passed for 2,812 yards and 24 scores and ran for an additional 1,530 yards and 18 touchdowns on the ground. Marlon Mack, the Bulls’ star running back, entered the NFL draft, while the production of left tackle Kofi Amichia and leading receiver Rodney Adams will need to be replaced. Strong has his work cut out for him with a defense that yielded 31.6 points per game last season, but nine starters return on that side of the ball. 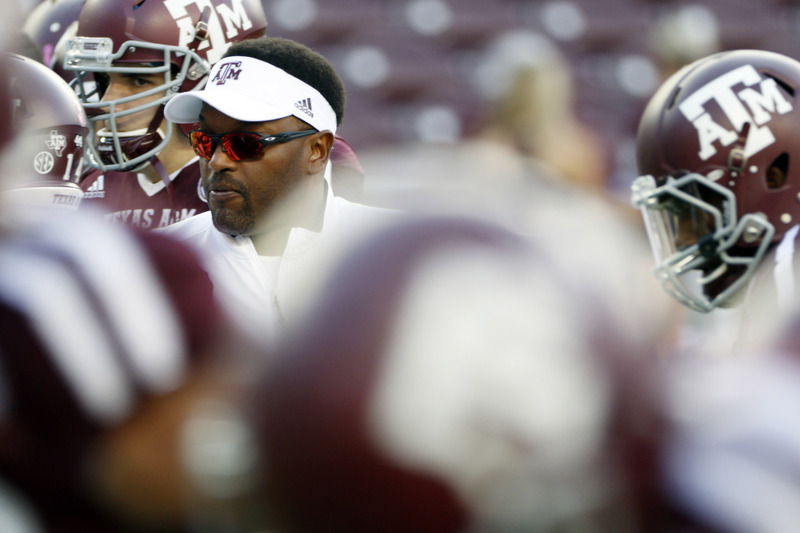 Texas A&M Aggies head coach Kevin Sumlin watches warm-ups prior to a game against the Mississippi State Bulldogs at Kyle Field. Kevin Sumlin, Texas A&M: Sumlin probably takes very little solace in knowing he groomed the top pick in the 2017 NFL draft, Myles Garrett. Especially knowing that three straight seasons of 8-5 finishes just isn’t cutting it for the folks in College Station. Although Sumlin has accumulated a 44-21 record over the past five seasons, he has not coached the Aggies to a winning record in conference since 2012. Quarterback Trevor Knight is gone, and junior Jake Hubenak and freshmen Kellen Mond and Nick Starkel are in a three-way battle to play under center this season. It may not matter who the signal-caller is, seeing as four of the team’s top five receiving options are no longer with Texas A&M. At least the team retained Christian Kirk, who finished with 83 catches, and has a good runner in Trayveon Williams, who finished with 1,057 yards in 2016. The defense also needs to take a long look in the mirror after giving up big plays, too many yards on the ground and a whopping 30.3 points per game in SEC play. Better luck with injuries could inject life into that unit this season. 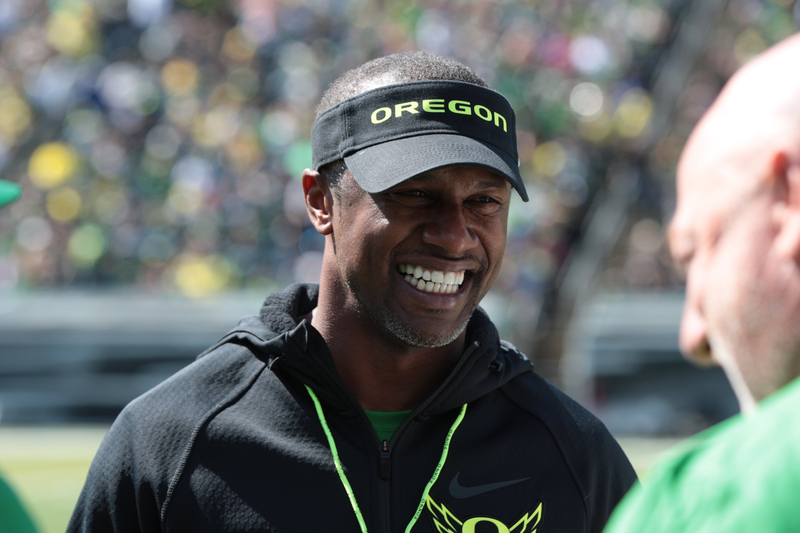 Oregon head coach Willie Taggart walks on the field before a game at Autzen Stadium. Willie Taggart, Oregon: What will incoming coach Taggart be able to do with the budding talent he inherited? That’s the question, especially as he comes to Eugene after the Ducks’ first losing season in 12 years. Running back Royce Freeman and receiver Charles Nelson insulate quarterback Justin Herbert, who tossed for 19 touchdowns and 1,936 yards as a true freshman. Left tackle Tyrell Crosby returns to the lineup after missing almost the entire 2016 season because of injury. Where Taggart needs to see substantial improvement is on the defensive side of the ball, which explains his hiring of coordinator Jim Leavitt, who had himself a year at Colorado. While games against Washington and Stanford will serve as the measuring stick for the Ducks, the team won’t have to play USC in a crossover game. 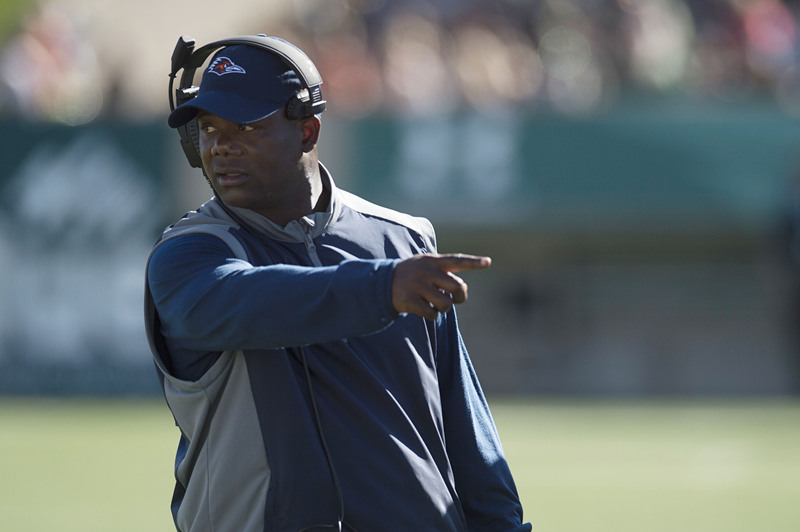 UTSA Roadrunners coach Frank Wilson gives instructions to the Roadrunners during a game against Colorado State Rams at Hughes Stadium. Frank Wilson, UTSA: The Wilson-led Roadrunners went to their first bowl game in program history in 2016. If the offense can unleash its bevy of wide receiver talents, with quarterback Dalton Sturm making gains and running back Jalen Rhodes continuing to build off his previous success, then UTSA may just challenge Louisiana Tech and Southern Miss in the Conference USA West Division. All of those offensive improvements are contingent on an offensive line that gave up 43 sacks last fall. Defensively, linebacker Josiah Tauaefa is ready for whatever the opposing team throws at him after finishing with 115 tackles last season as a sophomore. Senior La’Kel Bass at linebacker will anchor Wilson’s defense, which allowed just under four touchdowns a game (27.9 points) last season. 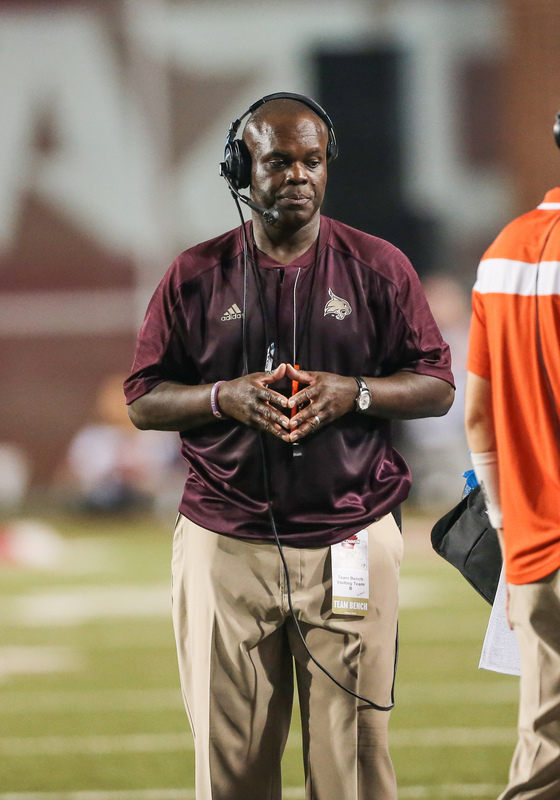 Texas State Bobcats head coach Everett Withers patrols the sidelines during an NCAA football game between the Bobcats and the Arkansas Razorbacks at Donald W. Reynolds Razorback Stadium, Frank Broyles Field, in Fayetteville, Arkansas. Everett Withers, Texas State: After a 2-10 finish in 2016, Withers has his work cut out for him in his sophomore season. His Bobcats lost nine of those 10 games by double digits. Poor offensive play across the board doomed Texas State, as the offensive line looked like a sieve, giving up 44 sacks, and the running game produced a measly 2.3 yards per carry. Mississippi State graduate transfer Damian Williams’ prospects of playing are up in the air, meaning Withers’ signal-caller could be a true freshman. The defense gave up 41.1 points per game and is in a rebuilding state with all of the youth on that side of the ball. *Coaches listed by name, school, years at the school and Associated Press Top 25 ranking if applicable.